Written by Kerryn Vaughan, our superwoman who runs many charity projects and is an incredible public speaker and one of the funniest and warmest women I have ever met. Recently I went to see Malala speak in Melbourne. 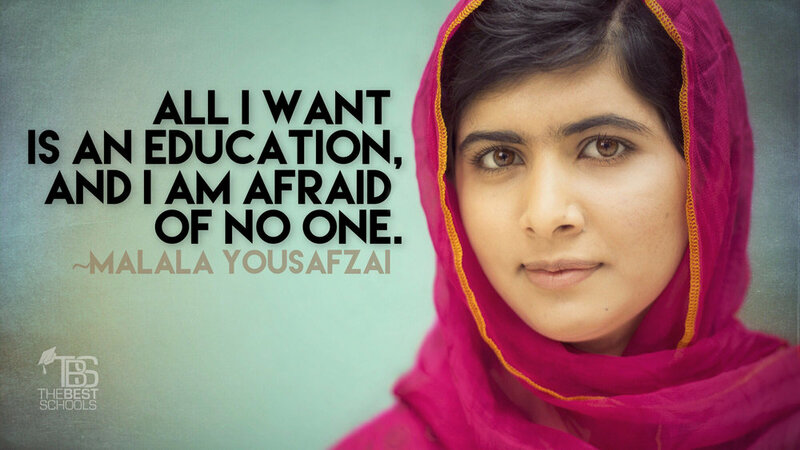 For those who don't know who Malala is, she was shot in the head as a teenager in Pakistan by the Taliban for speaking out that girls should have an education. Her talk was incredibly moving. I had always thought it would be impossible to ever be in the same room as Malala due to security issues etc. and had accepted that as a fair trade for her voice to continue. But to sit there in her space was incredible for me and everyone in the audience. The energy in the room was electric. I’m sure there were time management issues because almost every time she spoke the audience robustly applauded, and it was only too fitting. Malala spoke about the 130 million girls around the world who currently have no access to education. The reasons are varied but are primarily due to poverty, war and discrimination. She shared that to educate those 130 million it would cost governments around the world a total of 39 billion, and while that sounds a lot, the potential global economic growth would be 12 trillion. So, it seems everybody would win. The figures are daunting, and in a world where money speaks, you would think that would be inspiring for the bean counters. It seems not. Why? Because gender inequality and the oppression of females appears to have far more value, particularly for the patriarchal societies. Malala talked about how it felt, what she witnessed and what she was subjected to herself when the Taliban came to her village and violently took away their education, subsequently taking their rights away. The girls and women were beaten and some murdered, their educational supplies taken from them. Women were not allowed to drive or go to the market - they were not allowed to be in public without a male chaperone. Overnight they were transformed to obedient slaves without a voice. It is so incredibly hard to piece together how this vibrant, strong, charismatic young woman gracing the stage in front of 4,000 people had endured such degrading and debilitating treatment and still come out stronger than ever. Information about how Malala was tragically shot on the school bus did not dominate the night. She spoke about the event briefly but then made light of it, telling stories of the ‘grumpy’ doctor in the hospital in Birmingham UK and how she told her father to bring her physics books because she needed to study for an exam. It was clear she had no idea at that stage of the enormity of this event, or that she was about to become a world leader. Malala brushed over her Nobel Peace Prize award stating that she does not care for the prize itself but is appreciative that the award has given her an elevated platform to advocate for girls’ education. When asked if she was scared of anything, she jokingly replied that Australian spiders weren’t her favourite thing and that she is a bit afraid of dogs. She went on to say she doesn’t like to tell people what scares her, and for almost all of us, our minds would assume that meant she wants always to appear strong and show no chinks in her armour. But no, she doesn’t want to share those things because somebody might try to scare her as a joke, which brought home that Malala is not fearless - she is courageous, and there is a massive difference. The thing that struck me the most about Malala was her very witty sense of humour. She had the crowd roaring with laughter on multiple occasions and not out of politeness - she was hilarious! Right down to sharing how her mother still tells her to clean her room and that her clothes don’t match. She said, “My father thinks I do everything right, my mother thinks I do nothing right”. It doesn’t seem quite as funny when I write it here and perhaps it needs to be heard in conjunction with her childlike, yet exquisite, charisma. Concerning her father, Malala shared that he was her greatest inspiration and supporter. She called him when she started university at Oxford last year and told him she was going to meet boys and maybe the meetings would be ‘one to one’. Her father said he trusted her and Malala said: “Don’t trust me!”. Again, the crowd enjoyed this wit, which brought home that no matter how large and revered she is, Malala is still just a young woman looking for the same connections as the next young woman. Her point of difference - exceptional courage! There were a few standing ovations throughout the night, and I’m sure many were inspired to act more on the advocacy front and to take action to support the education of girls. For me, I was encouraged to expand the work I am doing in Africa through my NFP One Planet Classrooms and initiating ideas I have allowed to lay dormant. I intended to get to them ‘one day’, but for now I have so many ‘now’ things going on already. But she made me see this one can’t wait. ‘Now’ is the day to build programs that will see more girls in school. But for me it’s bigger than sitting girls’ bums on seats - it’s about the environment, the culture, the attitudes and outdated traditional practices, each of which perpetuates poverty, war and discrimination. I aim to educate the people who make the decisions for the girls, and so much more. My access to an amazing ‘on the ground’ network and other resources puts me in a position of responsibility and I acknowledge that as a real privilege. Since the talk I have reflected on how fortunate we are here in Australia and how very different the lives of many girls would be had I not decided a few years ago that every single one of us can positively impact the life of another. If not for that one decision, I would not have founded One Planet Classrooms, and the girls within our sponsorship program would be married with children and subjected to an existence that we in the western world can rarely appreciate. Malala reinforced to me that one person making one decision can re-write history. Imagine the impact if we all just held hands and took 'one more step' together to make a better a world. And thank you gorgeous Kerryn for sharing this brilliant article, for making me smile daily with your funny facebook posts and your love of animals.